In what must have been a heck of a last-minute push, Google managed to sign up several neighborhoods that weren’t looking like they would get Google’s service. As of Friday afternoon when I had counted 21,000 people having pre-registered for the service I noted at least 50 areas — what Google calls fiberhoods — that hadn’t yet made the cut and most were in low-income neighborhoods. When Google announced its plans to offer a gigabit service for $70 a month plus the $300 one-time connection fee as well as a free 5 Mbps service that allowed registrants to pay the $300 connection fee up front or over a period of 1 year at $25 a month, it also opened up a new way of signing up for the service. Three fiberhoods reached their goals on the very first day of our announcement and from there, you just took off, encouraging your friends and neighbors to pre-register. The momentum has been terrific—63 fiberhoods qualified in the past week alone. From Hanover Heights, which qualified for Fiber in just two hours, to Ivanhoe Southeast, Coronado and more, which just qualified in the last few hours, your response has been tremendous. While Google hasn’t disclosed numbers of pre-registered subscribers, it has surpassed my expectations when it comes to the number of neighborhoods where it will deploy fiber. The benefit of getting even the minimum number of people signed up in neighborhoods is that Google will then deploy gigabit service to select schools and community centers, where even residents who didn’t sign up can see the Internet at gigabit speeds. Hopefully that will prompt greater adoption. It seems Google Is Working Hard to make the project a Big Success. It Would be Interesting to see if they bypass the Cons Noticed in the previous Review Articles. 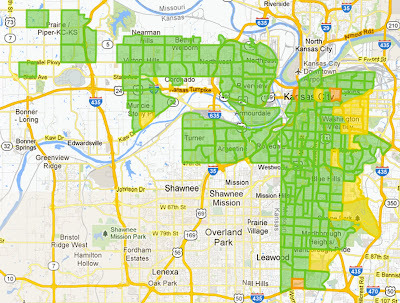 It’s only going to part of the greater Kansas City area. Needs to expand into surrounding area on both sides of the state line. It misses the suburbs entirely and thus a large portion of the population and businesses in the area. Get your facts straight, you only pay the $300 fee for the free service, it is waived for the Gigabit internet and Gigabit internet & tv service. You pay a $300 connection fee regardless of the package you choose. I doubled checked and I was wrong. I fixed the story and thank you guys!